Arena Nacionalista Reyna de Reynas Championship (Arena Nacionalista Queen of Queens Championship) is a women's lucha libre championship in Arena Nacionalista. The Championship was created by Arena Nacionalista in 2017. 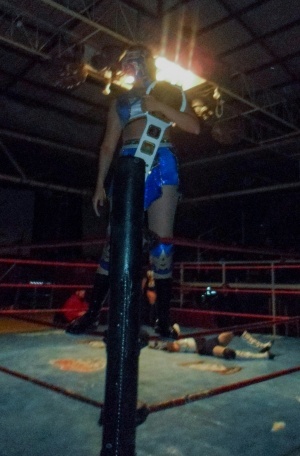 Aira is the current champion, she defeated Princesa Tirana and Princesa Hernández on January 20, 2019 in Arena Nacionalista. On October 29, 2017, Arena Nacionalista introduced the Reyna de Reynas Women's Championship as part of its 28th Anniversary. In order to crown the first champion there was a ladder match. The rules were the following. The competitors should climb the ladder to reach the hanged title and the could be eliminated by submission or pinfall. The ladder could be used as a legal weapon as well. The participants were: Navitt, Miss Tiger, Gehena, Princesa Hernández, Baronessa & Princesa Tirana. Miss Tiger became the first champion by reaching the title. This page was last edited on 21 January 2019, at 01:56.